The start of the new league year begins March 14, and with that, the 2017 NFL season is more than officially over. The 2017 season saw an offensive line seemingly carry its offense to the ultimate crown while portions of other teams’ struggles can be attributed to offensive line struggles. The following rankings for the league’s offensive lines are a look back at the 2017 season only, and do not reflect any moves that each team has made with regards to looking ahead to 2018. Our comprehensive PFF player grades take into account every aspect of a lineman’s game on every play from every game — their performance in both pass-blocking and run-blocking, and their discipline. Our PFF Player Grades showcase the true effectiveness of an offensive lineman as an individual, so we’ve taken that a step further to give you a look at how the units graded out, on average during the 2017 regular season. “Games are won in the trenches” – a phrase considered to be cliché by many. However, the 2017 Philadelphia Eagles once again proved this theory accurate. Philadelphia fielded the best offensive line in the NFL and it was a large reason why the Eagles hoisted the Lombardi Trophy for the first time in franchise history. The Eagles finished the regular season with the eighth-highest pass-blocking efficiency rating (80.9) and were led by right guard Brandon Brooks in pass-blocking as he did not allow a single sack all season. 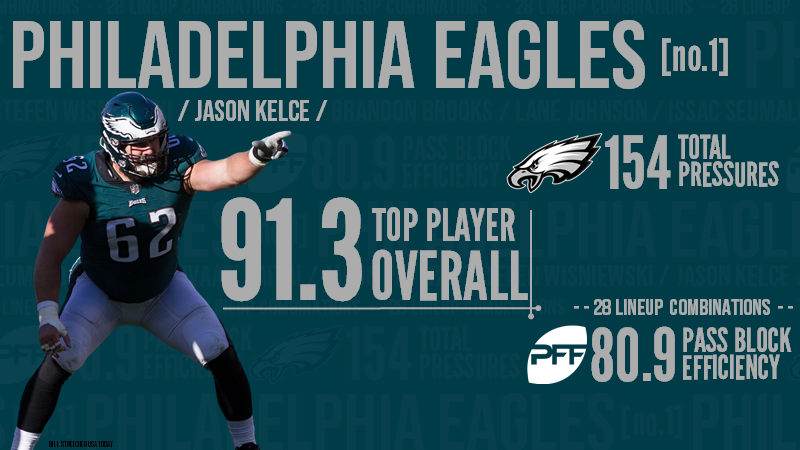 Philadelphia’s run-blocking was anchored by center Jason Kelce, who had a career year and finished the season as the highest-graded center in the NFL. The Eagles running game relied on traps more than any other team in the NFL while they also averaged a whopping 6.87 yards on these runs. The Atlanta offensive line might be the complete opposite of the Tennessee unit in that the performances at the guard position did not come close to the level of play at offensive tackle and center, especially following the injury of left guard Andy Levitre. A lot of what the Falcons do on offense relies on their outside zone runs – a concept they used more times than any other team in the league – and once again they found success on these runs as they averaged 4.45 yards on outside zone, the eighth-highest in the NFL. 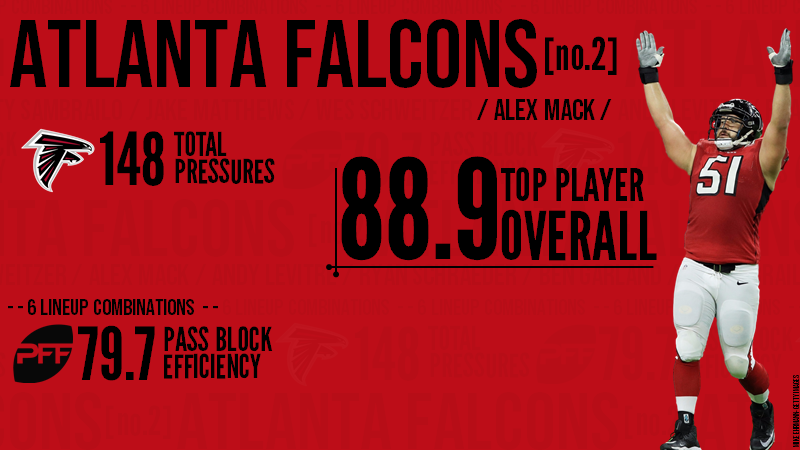 However, Atlanta’s pass protection was not close to perfect in 2017 as they ranked just 12th in pass-blocking efficiency rating (79.7) after the regular season and QB Matt Ryan was under pressure on 33.9 percent of his dropbacks, the 15th lowest rate in the NFL. The Patriots’ offensive line heavily improved as the season rolled on, largely due to left tackle Nate Solder’s solid form during the second half of the season. While the young interior trio of left guard Joe Thuney, center David Andrews and right guard Shaq Mason performed consistently well over the entire season, Solder started 2017 slow, only to make up for it by allowing just one sack in his final 16 games after giving up three in the first three weeks. While their pass protection improved after their bye in Week 9, this unit was known mainly for its run-blocking as they averaged 1.76 yards before contact – the sixth-highest in the league – on outside zone runs, their most heavily featured run concept. 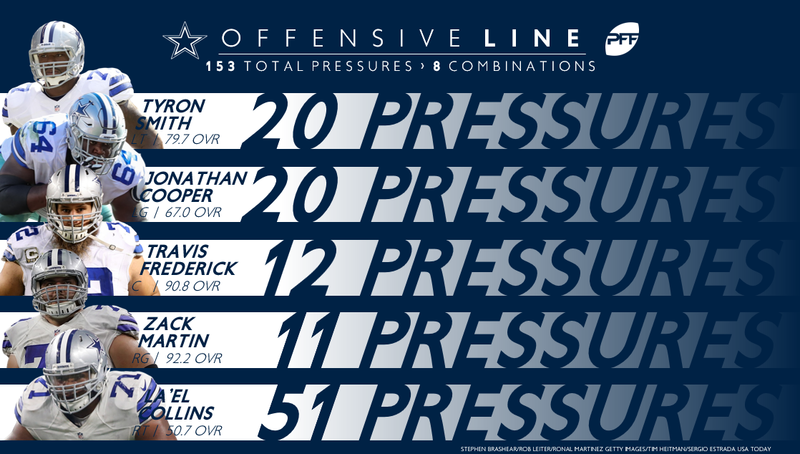 While the Cowboys struggled to replace left guard Ronald Leary and right tackle Doug Free, the dominance of center Travis Frederick and right guard Zack Martin still made this one of the best offensive lines in the league, even if they did not perform at the same level along the entire line. Left guard Jonathan Cooper was able to bounce back from a rough game in his first start against the Rams in Week 4 and allowed just six total pressures over his last six games. In addition, this unit could have been even better if not for left tackle Tyron Smith’s injuries, which forced him to miss some time. However, Frederick and Martin were once again among the best at their positions and combined to allow just one sack all season. 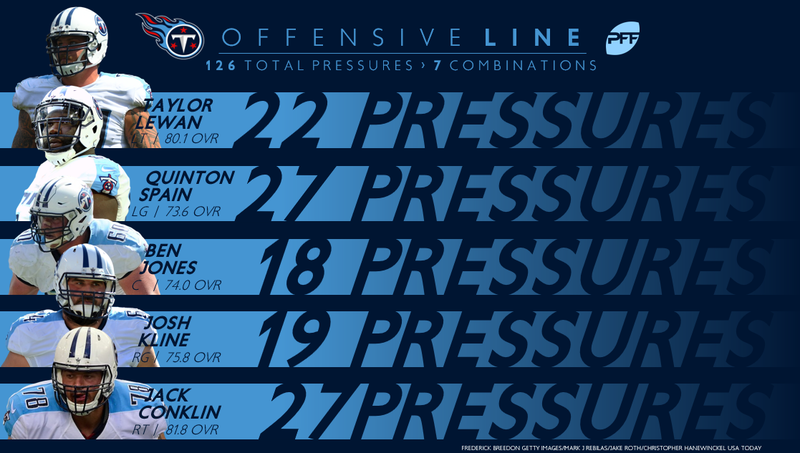 Although the Titans’ bookend tackles of Taylor Lewan and Jack Conklin – both former first-round picks – performed slightly better than the interior trio, the Tennessee offensive line might be the most balanced unit in the league, where there is the smallest difference between the weakest link and the best performer. Their offensive line was able to consistently create space on inside zone runs – the Titans’ most frequently used run concept – as their backs averaged 2.12 yards before contact on these runs, the third-highest in the league and significantly more than the league average of 1.56 yards before contact. In addition, the Titans finished the regular season with a pass-blocking efficiency rating of 82.3, which was tied for the third-highest rating in the league as they surrendered 126 total pressures – and just 14 sacks – on 553 pass-blocking snaps. A unit that went from being a liability to becoming the strength of the team, the Rams’ offensive line had a surprisingly solid season. Veteran guard Rodger Saffold had his best season to date, while right guard Jamon Brown was able to bounce back following a tough first month when he struggled against Washington and San Francisco. In addition, free agent acquisitions John Sullivan and Andrew Whitworth were still able to perform at a high level at the ages of 32 and 36, respectively. However, Whitworth has finally showed signs of a slight decline as he surrendered six sacks in 2017, the most he has allowed in a single season since his rookie campaign in 2006. Overall, the line gave a big help to our Comeback Player of the Year Todd Gurley as Rams running backs averaged 1.90 yards before contact, the fifth-most in the NFL. This was a unit that improved a lot over the second half of the season and eventually finished the regular season with the second-highest pass-blocking efficiency rating (83.0). This was largely due to the improvement in play from left guard Richie Incognito as he allowed just three total pressures – and no sacks or hits – in his last nine games after giving up 12 total pressures in his first eight. In addition, rookie left tackle Dion Dawkins replaced Cordy Glenn due to injuries, but he did not disappoint and was actually among the five best left tackles in the league over the second half of the season. Furthermore, this unit was once again among the best in the NFL when it came to helping ball carriers as Bills’ running backs averaged 1.92 yards before contact in 2017, the fourth-most in the league. 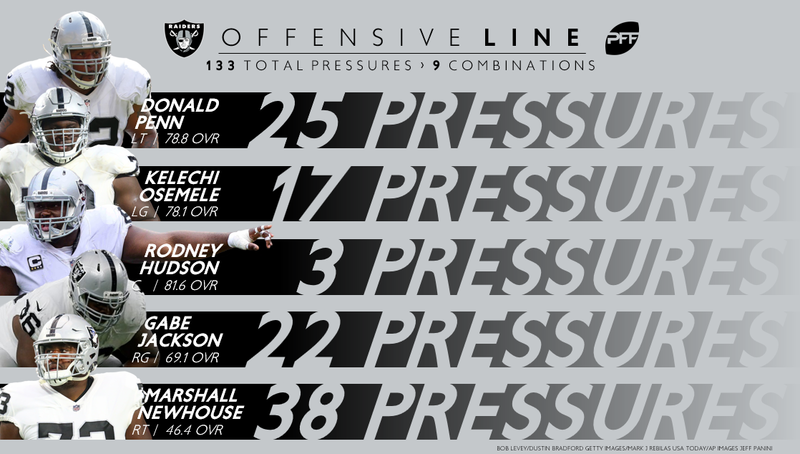 The Oakland offensive line had a slightly disappointing season following a stellar 2016 campaign, but they were still among the 10 best offensive lines in football. The unit was anchored by center Rodney Hudson, who allowed just three total pressures the entire season and was named PFF’s best pass-blocker. However, guards Gabe Jackson and Kelechi Osemele and left tackle Donald Penn had all had a weaker season by their standards. The Raiders also failed to find a reliable alternative for the right tackle position as Marshall Newhouse and Vadal Alexander both allowed a large number of pressures, especially considering that they did not play as many snaps as the other four members of the line. In addition, Oakland running backs averaged just 1.34 yards before contact, which was the seventh-lowest in the NFL last season. While it was mostly the Saints defense that received praise for a surprisingly strong season, the New Orleans offensive line also performed above expectations and led the league with a pass-blocking efficiency rating of 84.6 while they allowed the fewest pressures in the entire NFL over the regular season (110). 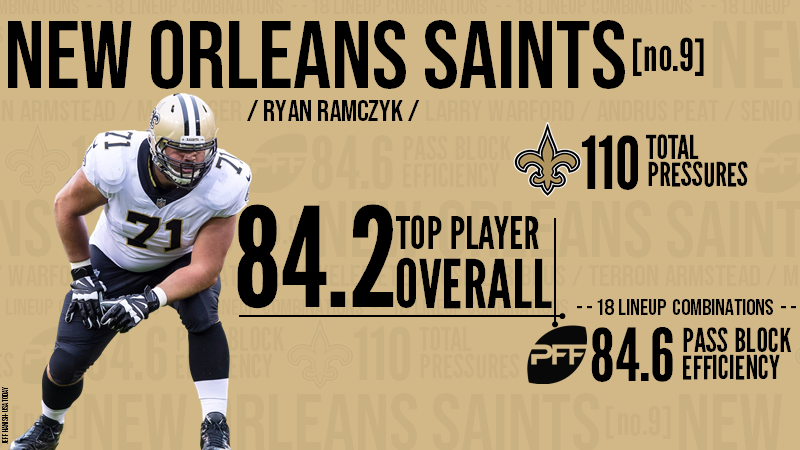 A lot has been made of the additions of Marshon Lattimore and Alvin Kamara in the 2017 NFL Draft, but Ryan Ramczyk has seemingly become the best player on their line and one of the best right tackles in the entire league already after his first season. The offensive line was also effective on zone runs as Saints’ backs averaged 2.56 yards before contact on inside zone runs (second in the NFL) and 1.80 yards before contact on outside zone runs (fifth). The Panthers’ offensive line might have been the most unbalanced line in the NFL in 2017 as it had a couple elite standout performances while there were a couple liabilities on that line as well. Left guard Andrew Norwell was in fact the league’s best pass-protecting guard in 2017 as he did not allow a single sack or hit and gave up just 13 total pressures all season. However, on the other side, right guard Trai Turner gave up precisely twice as many pressures while also playing significantly fewer snaps. A similar theme was true for tackles as well since right tackle Daryl Williams performed well in pass protection and run-blocking while free agent acquisition Matt Kalil struggled in both areas although he did play better toward the end of the season. The Panthers however, led the league with an average of 2.89 yards before contact on inside zone runs. On one hand, this unit was marred by injuries (Kyle Long) and sophomore slumps (Cody Whitehair), but on the other, there were a couple standout performances as well. Left tackle Charles Leno Jr. has developed into a solid player as he had his best season to date. He gave up just seven pressures over the last seven games of the year while he also had his best run-blocking season. Whitehair had a slightly disappointing year as he allowed 26 total pressures this season after surrendering just 14 in his rookie campaign, but this was also partially due to him having to play at multiple positions as a result of injuries. 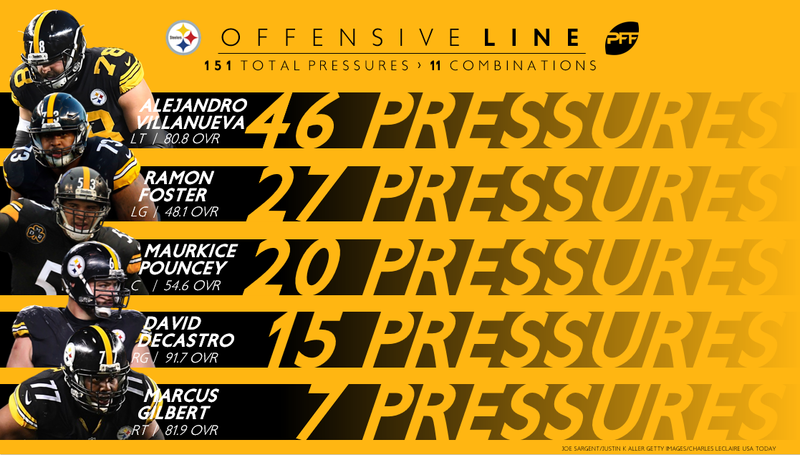 The Steelers’ offensive line was unable to live up to the expectations they themselves set with their strong performance in the playoffs during the 2016 season. This unit was also hurt by injuries and suspensions while left tackle Alejandro Villanueva failed to take the next step that his play down the stretch in 2016 suggested he could take in 2017 and one that would have elevated him into the discussion about the best tackles in the NFL. However, right guard David DeCastro was able to build on a strong 2016 season and put together an elite performance as he was the only member of this unit not to allow a sack all season. It’s nearly impossible to evaluate the Packers’ offensive line as a unit, as nine different offensive linemen played more than 200 snaps for Green Bay in 2017. While David Bakhtiari is still arguably one of the best left tackles in the entire NFL, he also had to miss time last season and was surrounded with subpar performances even when he was able to stay on the field. The Packers will be looking for a bounce back season from center Corey Linsley in 2018 who was the lone offensive lineman to play every snap for Green Bay, but had the worst season of his career as he allowed at least one pressure in all but one game. While pass protection was an issue, the unit did a better job in run-blocking as Green Bay backs led the NFL with 2.04 yards before contact on carries. 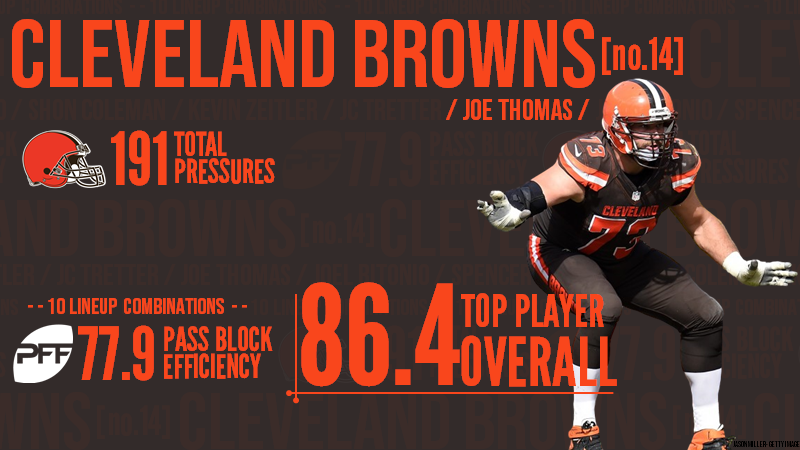 The Browns invested heavily in their offensive line prior to the 2017 season; however, their best performers were still their incumbent starters in left tackle Joe Thomas and left guard Joel Bitonio. The veteran Thomas was still going strong in 2017 as he did not allow a single sack on his 331 pass-blocking snaps prior to his season-ending injury. Following his injury, pass protection became a liability on the edges, however, as young tackles Shon Coleman and Spencer Drango both struggled in their second season in the NFL. Nevertheless, the unit had relative success in run-blocking throughout the season as the Cleveland running backs averaged 1.81 yards before contact, the eighth-most in the NFL. Jacksonville’s offensive line had a lot of success in run-blocking as the 1.95 yards Jaguars running backs averaged before contact ranked second in the NFL last season. The unit was anchored by Brandon Linder, who has established himself as one of the best centers in the league over the past couple of seasons as he did not allow a single sack all year. Right tackle Jermey Parnell has been consistently solid for a couple seasons as well and similarly to Linder, did not allow a single sack all season. On the other side, however, rookie left tackle Cam Robinson went through some growing pains in his first season in the NFL as he played 13 games in the regular season and was called for 12 penalties in these games while he allowed at least three total pressures in 10 games, including the playoffs. The Chiefs’ offensive line got off to a solid start in the first month of the season, but injuries started to pile up as the season went on and the Chiefs lacked depth to overcome these injuries. In addition, most of their linemen were unable to perform at a consistent level and there were occasional subpar performances combined with great outings. This inconsistency was recognizable between run concepts as well. While the Chiefs averaged 5.16 yards (2.21 before contact) on outside zone plays, which was the third-most in the league, they averaged just 2.93 yards (0.90 before contact) on inside zone plays, which was last in the NFL. Tampa Bay’s Demar Dotson has been quietly among the best right tackles in the league for a while now and he was once again off to a terrific start in 2017 before injury forced him to miss the end of the season. In addition, Ali Marpet stood his ground well enough in his first season at center in Tampa that he was the team’s second-best offensive lineman even at a new position. The Buccaneers failed to consistently find success on the ground all season and their offensive line also struggled in run-blocking as evidenced by their most frequently used run concept, the inside zone. The Bucs averaged just 1.21 yards before contact on these runs, the seventh-fewest in the NFL. The Ravens saw average performances at both tackle positions and at center in 2017, but they could not overcome the injury of star guard Marshal Yanda and struggled at both guard positions all season long. Second-year left tackle Ronnie Stanley kicked off a very promising start over the first two months of the season, but was unable to finish the season strong as he surrendered at least two pressures in seven of his last 10 games. In addition, while the Ravens like to rely on outside zone runs, they averaged just 1.09 yards before contact on these runs, which was below the league average of 1.21 yards. The Lions made additions to their offensive line prior to the season and both right guard T.J. Lang and right tackle Rick Wagner proved to be good investments as they became the Lions’ best pass protectors. However, Detroit struggled on the ground and averaged 3.35 rushing yards, the fewest in the NFL. The Lions’ offensive line was also partially to be blamed for these issues, as Detroit running backs averaged just 0.96 yards before contact, the second-lowest average in the league. Furthermore, on outside zone runs – Detroit’s most frequently used run concept – the Lions averaged just 0.45 yards before contact, the sixth-lowest in the NFL. San Francisco is another unit that features a standout player while surrounding players have been unable to come close to that level of play. Left tackle Joe Staley still produced valiantly at the age of 33 as he allowed just six total pressures in the last eight games of the season and finished the year against the Rams with one of the most dominant games by any offensive tackle all season. On the other side of the line, right tackle Trent Brown’s performance gradually tailed off after a strong start. Nevertheless, Brown was still among the better pass-protecting tackles in the league, even if he slightly struggled in run-blocking. Altogether, the 49ers’ offensive line did a solid job of assisting ball carriers as they helped their backs to an average of 1.86 yards before contact, the seventh-highest average in the NFL. While Washington fielded two elite offensive linemen to start the season in left tackle Trent Williams and right guard Brandon Scherff, both of them struggled to stay on the field in 2017. As a matter of fact, the entire Washington line was marred by injuries a season ago as a whopping 11 offensive linemen played at least 140 snaps for the Redskins in 2017. The injuries had their impact and the Washington offensive line never really got into rhythm over the season. Redskins running backs averaged just 1.29 yards before contact, the fifth-fewest in the NFL while the unit allowed 25 sacks on the season, tied for the sixth-most. Minnesota saw a lot of new pieces in place along the offensive line for the 2017 season as both tackle positions and the center position were filled by new members. These moves had mixed results for the Vikings, however. Riley Reiff has been a disappointment so far for the Vikings as he was not able to replicate the level of play we got used to from him in Detroit. Rookie center Pat Elflein did show some promising signs occasionally, but still struggled and allowed more pressure on fewer snaps than guard Joe Berger. Right tackle Mike Remmers played well and was one of the better acquisitions made by the Vikings until he got moved to guard towards the end of the season – a position he had never played before – and he struggled in December and January. While the Vikings’ offensive line allowed just 11 sacks, which was the third-fewest in the NFL, this was often largely due to QB Case Keenum’s ability to avoid defenders and get rid of the ball before he would be taken to the ground. Broncos fans were probably not sure what to expect from their offensive line in 2017 as the team had three new starters in their first game. Guard Ron Leary proved to be a perfect free agent signing as he has quickly become Denver’s best offensive lineman and he played well both in pass protection and run blocking. The acquisition of right tackle Menelik Watson was not so successful and he was replaced after allowing nine sacks through seven games. Rookie left tackle Garett Bolles showed some good signs in run-blocking, but struggled in pass protection and was called for 14 penalties, tied for the second-most among offensive tackles. Overall, the unit finished the season by giving up the second-most sacks (32) and the fourth-most pressures (207) while also having the third-lowest pass-blocking efficiency rating (75.1) in the NFL. The Chargers dedicated a large part of their 2017 offseason to strengthening the offensive line as they signed left tackle Russell Okung and drafted guards Forrest Lamp and Dan Feeney. While Okung did become a solid left tackle for the team and the Chargers best offensive lineman, Lamp suffered a season-ending injury in the preseason and Feeney struggled to find his feet in his first year. Although the Chargers allowed just nine sacks, tied for the fewest in the NFL, it is a misleading stat as Philip Rivers led the league with 35 throwaways. However, the Chargers’ offensive line was slightly more effective in run-blocking as their running backs averaged 1.47 yards before contact, which was just below the NFL average of 1.56 yards before contact. Injuries forced 10 different Colts’ offensive linemen to play at least 140 snaps and many of them were also asked to play multiple positions. While left tackle Anthony Castonzo and left guard Jeremy Vujnovich played all 1,030 snaps for Indianapolis, players rotated in and out of the lineups at the other positions. Second-year players Ryan Kelly and Le’Raven Clark both failed to reach 400 snaps, but even when on the field, both appeared to have taken a step back following their slightly promising rookie campaigns. With the exception of Castonzo, the entire line struggled in run-blocking and as a result, Colts backs averaged just 1.07 yards before contact, the third-lowest in the NFL. Probably one of the most heavily criticized units in the entire NFL, the Giants’ offensive line failed to prove critics wrong. Nevertheless, left tackle Ereck Flowers showed a small improvement and put together the best season of his career. Although, admittedly, the bar was not set high and this performance earned Flowers just the 54th-highest grade among offensive tackles. Injuries also hurt the unit as there were nine different New York offensive linemen who played at least 250 snaps this past season. In addition, their offensive line allowed 27 sacks in 2017, which was the fourth-most in the NFL. It’s uncertain how much left tackle Duane Brown has left in the tank, but his acquisition via trade during the season was a move that paid dividends for Seattle as he quickly became their best offensive lineman. On the other hand, second-year right tackle Germain Ifedi’s struggles have continued as he allowed a pressure in every game and at least three pressures in 10 games. Furthermore, Ifedi was called for 19 penalties in 16 games, by far the most among all players. Center Justin Britt also took a step back in 2017 following a promising 2016 campaign. Seattle continued to rely on their zone blocking, but the Seahawks averaged just 0.63 yards before contact on outside zone runs, the 10th-least in the league. Prior to the 2017 season, the Bengals chose not to retain free agents Andrew Whitworth and Kevin Zeitler. That decision came back to bite them during the season as Cincinnati’s offensive line heavily struggled in 2017. The Bengals had 10 different offensive linemen play at least 80 snaps and all 10 of them gave up at least one sack. However, Cincinnati’s struggles were not limited only to pass protection. The Bengals averaged just 3.17 yards (and 0.93 yards before contact) on outside zone runs, which was the fifth-lowest in the NFL and the third-lowest among teams that used this concept at least 100 times. The Dolphins’ offensive line had a disappointing season, especially considering the unit features three former first-round picks and only one of them – right tackle Ja’Wuan James – has performed at an NFL starter level. However, when it comes to pass protection, the unit played relatively well, which led to the sixth-highest pass-blocking efficiency rating (81.7) in the NFL as they allowed just 153 total pressures on 646 passing plays. The bigger issues came in the running game where Miami’s offensive line struggled mightily and all linemen graded poorly. Consequently, Miami’s running backs averaged just 0.59 yards before contact, which was last in the NFL by a wide margin (Detroit was second to last with 0.96 yards) and well below the NFL average of 1.56 yards before contact. The Jets are this low on the list despite the fact that they remained relatively healthy throughout the season and had only five offensive linemen play more than 400 snaps. However, each of them allowed at least two sacks and all graded poorly in run-blocking as well. As a result, the Jets’ offensive line allowed a total of 25 sacks, which was tied for the sixth-most in the NFL. Interestingly however, they were among the better teams running the outside zone concept as their backs averaged 2.07 yards before contact on these runs, the third-most in the league. The Cardinals’ offensive line struggled all over the board and had seven different offensive linemen give up two or more sacks. As a result, the Arizona line did end up with surrendering 217 total pressures, the second-most in the NFL. The move to play career left tackle Jared Veldheer at right tackle did not pay off either for the Cardinals as Veldheer struggled early in the season at his new position, allowing 27 total pressures in the first five games. However, he did improve and put together a couple solid games on the right side before moving back to the left and finishing the season with a few good outings on his usual side of the line. It says a lot about Arizona’s struggles in the running game that their backs averaged -0.21 yards before contact on outside zone runs even though they ran that concept more than 40 times this season. The Houston offensive line struggled all season long as Deshaun Watson and Tom Savage were the two most frequently pressured quarterbacks in the league, under pressure on 47.7 percent and 46.7 percent of their respective dropbacks. Furthermore, not only did the unit allow the most total pressures (253) by a wide margin, they also gave up the most sacks on the season with 35. The Texans signed right tackle Breno Giacomini prior to the season, however, he struggled in pass protection and allowed 81 total pressures on the season or 5.1 per game. Even the fact that Houston’s running backs averaged 1.59 yards before contact – more than the league average – did not compensate for the unit’s deficiencies in pass protection.